American patriot, was born at West Barnstable, Massachusetts, on the 5th of February 1725. He was the eldest son of James Otis (1702-1778), fourth in descent from John Otis (1581-1657), a native of Barnstaple, Devon, and one of the first settlers (in 1635) of Hingham, Mass. 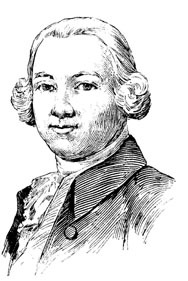 The elder James Otis was elected to the provincial General Court in 1758, was its speaker in 1760-1762, and was chief justice of the Court of Common Pleas from 1764 until 1776; he was a prominent patriot in the colony of Massachusetts. The son graduated at Harvard in 1743; and after studying law in the office of Jeremiah Gridley (1702-1767), a well-known lawyer with Whig sympathies, rose to great distinction at the bar, practicing first at Plymouth and after 1750 at Boston. In 1760 he published Rudiments of Latin Prosody, a book of authority in its time. He wrote a similar treatise upon Greek prosody; but this was never published, because, as he said, there was not a font of Greek letters in the country, nor, if there were, a printer who could have set them up. Soon after the accession of King George III to the throne of England in 1760, the British government decided upon a rigid enforcement of the navigation acts, which had long been disregarded by the colonists and had been almost wholly evaded during the French and Indian War. The Writs of Assistance issued in 1755 were about to expire, and it was decided to issue new ones, which would empower custom house officers to search any house for smuggled goods, though neither the house nor the goods had to be specifically mentioned in the writs. Much opposition was aroused in Massachusetts, the legality of the writs was questioned, and the Superior Court consented to hear argument. Otis held the office of advocate-general at the time, and it was his duty to appear on behalf of the government. He refused, resigned his office, and appeared for the people against the issue of the writs, Gridley appearing on the opposite side. The case was argued in the Old Town House of Boston in February 1761, and the chief speech was made by Otis. His plea was fervid in its eloquence and fearless in its assertion of the rights of the colonists. Going beyond the question at issue, he dealt with the more fundamental question of the relation between the English in America and the home government, and argued that even if authorized by act of parliament such writs were null and void. The young orator was elected in May of the same year a representative from Boston to the Massachusetts General Court. To that position he was re-elected nearly every year of the remaining active years of his life, serving there with his father. In 1766 he was chosen Speaker of the House of Representatives, but the choice was negatived. In September 1762 the younger Otis published A Vindication of the Conduct of the House of Representatives of the Province of Massachusetts Bay, in defense of the action of that body in sending to the governor a message (drafted by Otis) rebuking him for asking the assembly to pay for ships he had (with authorization of the Council and not of the representatives) sent to protect New England fisheries against French privateers; according to this message "it would be of little consequence to the people whether they were subject to George or Louis, the king of Great Britain or the French king, if both were as arbitrary as both would be if both could levy taxes without parliament." He also wrote various state papers addressed to the colonies to enlist them in the common cause, or sent to the government in England to uphold the rights or set forth the grievances of the colonists. His influence at home in controlling and directing the movement of events which led to the War of Independence was universally felt and acknowledged; and abroad no American was so frequently quoted, denounced, or applauded in parliament and the English press before 1769 as the recognized head and chief of the rebellious spirit of the New England colonists. In 1765 Massachusetts sent him as one of her representatives to the Stamp Act Congress at New York, which had been called by a Committee of the Massachusetts General Court, of which he was a member; and here he was a conspicuous figure, serving on the committee which prepared the address sent by that body to the British House of Commons. In 1769 he denounced in the Boston Gazette certain customs commissioners who had charged him with treason. Thereupon he became involved in an altercation in a public-house with Robinson, one of the commissioners; the altercation grew into an affray, and Otis received a sword cut on the head, which is considered to have caused his subsequent insanity. Robinson was mulcted in �2000 damages, but in view of his having made a written apology, Otis declined to take this sum from him. From 1769 almost continuously until his death Otis was harmlessly insane, though he had occasional lucid intervals, serving as a volunteer in the battle of Bunker Hill in 1775 and arguing a case in 1778. He was killed by lightning (it is said that he had often expressed a wish that he might die in this way) at Andover, Mass., on the 23rd of May 1783.